Blurb: Eleven minutes passed before Delaney Maxwell was pulled from the icy waters of a Maine lake by her best friend Decker Phillips. By then her heart had stopped beating. Her brain had stopped working. She was dead. And yet she somehow defied medical precedent to come back seemingly fine. Everyone wants Delaney to be all right, but she knows she's far from normal. Pulled by strange sensations she can't control or explain, Delaney finds herself drawn to the dying. Is her altered brain now predicting death, or causing it? Then Delaney meets Troy Varga, who recently emerged from a coma with similar abilities. At first she's reassured to find someone who understands the strangeness of her new existence, but Delaney soon discovers that Troy's motives aren't quite what she thought. Is their gift a miracle, a freak of nature or something much more frightening? (Delaney) "I shouldn't be alive." (Decker) "You were in ice-cold water. It slows the body's metabolism. So you don't use that much oxygen. Or something." (Delaney) "Then how come everyone's acting like I shouldn't be alive?" (Decker) "Because it's rare. I mean, really, really rare. Like snow in August." (Decker) "No, I guess not. But it's not impossible, right?" My thoughts: Lured in by a beautiful cover, a more than interesting synopsis and not to forget some really good reviews by other book bloggers, I had to pick it up. I was a bit frustraded when I read Fracutre is "for fans of best-sellers like "Before I Fall" and "If I Stay", because Before I Fall doesn't work for me, neither the content nor the characters. So it's not a lie to say I was skeptical of reading Frature. Not another bad book in my shelf. But thanks God, this book is different. Fracture is well-written and I liked it content and of course the characters but sadly it hasn't rocked my socks off, as I expected. Even so Delaneys fate is quite fascinating and you automatically will care about that issue - the fine line between life and death. I don't like spoilers but sometimes it's too difficult to explain without giving some facts. So if you want to read this book, do not read on the next few sentences, please. There are so many questions Delaney had, because of her abilities. Do they predicting death or causing it? Well, what would you do when you saw people are going to die very soon? Do you want to save their lives? Yes of course, I would try. That's what my first toughts would say. But is it right? You have to ask yourself if you are a life preserver or not! What about the saved life who will it 'acting' or will it generally be livable again? There are so many questions you have to ask but much more answers you can give. These questions and thoughts I had during the read make the book working for me. 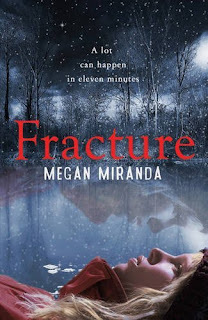 Fracture is a page-turning read, but it is although a book which doesn't let you go. You have to think about it more than an hour or a day and it is one of a few books which touched my innerself.